When a blade wants to flap up or down, the forces involved are significant. This leads to large moments being transmitted to the shaft, and these are prevented from working by the use of flapping hinges, or some other form of flexible material. Nevertheless, the blade flapping hinges do still transfer some moment to the shaft, due to their offset there. 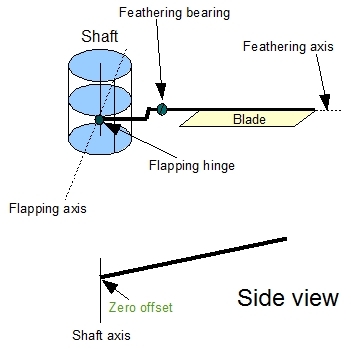 When flapping hinges are used, the offset, as depicted in the figure below in green, determines the amount of the moment that is transmitted to the shaft because of disc tilting. 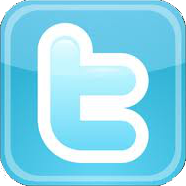 When the offset is zero (second figure), the moment, 'm', cannot be transmitted because the arm is zero. This design makes it possible to use a less substantial shaft and rotorhead construction. This saves weight and will, therefore, require less engine power. Another solution is to use a teetering hinge in a 2 bladed rotorhead. As the teetering hinge pins coincide with the shaft axis, we again have a zero offset configuration. A disadvantage of zero offset heads is that they are prone to a phenomenon known as negative g, from which the consequences can be quite catastrophic. Negative g is present when the rotorthrust is upwards and 'pushing' the helicopter down. The helicopter now accelerates downwards, and the pilot will experience less body weight, hence the name, negative g.
Because of the design of a zero offset head, the helicopter can be pushed to any site. Pushing it down is not a mechanically stable movement, unlike when the helicopter is pulled upwards, against gravity. So, in these circumstances, there is a real danger that the helicopter will change attitude dramatically in any direction. The blades will then hit the blade droop stops with enough force to severely damage the shaft. The consequence will probably be break down. It is also quite possible that the blades will cut through the tailboom. Negative g with zero offset heads must be prevented at all costs. This is the pilot’s responsibility.